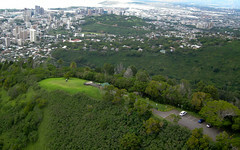 I flew Tantalus the day before yesterday with Scot and Dave, and I shot some clips with my little point-and-shoot camera. The conditions were perfect, smooth ridge lift with some nice thermals in the mix, and the boys made the most of it. Where was I that beautiful day...? A better question is, what are you doing up at this ungodly hour??? I'm done messing with video - goodnight! Very cool video work Alex, I don't envy you staying up late to edit though. That was a very nice day, seeing as I got a phone call from Mike Doyle as Scot launched. I made a beeline up to launch and had a great flight under a falling cloudbase and increasing wind. You guys even had post flight thirst quenchers. The only bummer was the video girl's rental car getting broken into. I went back to work and then flew at Diamond Head at sunset from the "high" launch with Chandler and Scraps assisiting. I was watching the video and realize that Scot's last landing is a few feet away from a inadvertant spin landing, it would have been impressive.